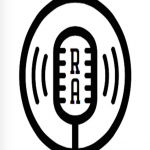 Rap Analysis – Who Is More Versatile, Black Thought Or Waka Flocka Flame? There are two main challenges in the writing about rap from a strictly musical point of view, and not a poetic one, for instance. One is keeping my argument mostly at the level where anyone, even non-musicians, can understand it. The second is making all of my arguments as quantitative as possible, and thereby most convincing. I have to do that because I’m writing about a strictly sonic phenomenon, and so it’s hard to demonstrate any of my claims, even when I’m just giving general descriptions. If I were talking about poetry or race relations, I could quote or transcribe song lyrics; I can’t do that for the strictly musical elements of rap. All of this is especially challenging when discussing a musician’s versatility, or lack thereof. However, some simple statistical analysis, equally understandable by the layman or laywoman, can bolster what might be the shortcomings of strictly music analysis in dealing with those 2 problems mentioned above. In lots of my other articles, I’ve described what bars are. As a reminder, they’re the building blocks of musical time that are always repeated in a song, and always last the same amount of time. They’re similar to how minutes are the building blocks of chronological time. However, bars are different from minutes because bars can last different amount of times between different songs. We need this so that some songs can be slow, and other songs can be fast. Rap songs, especially recently, have a much narrower range of speeds in which they appear. As we’ll see, this is usually somewhere between 60 and 120 BPM. However, this does not bespeak a closemindedness of rap’s music-makers; instead, it only emphasizes the importance of a unique and personal approach that must come from the rapper on every song. Using an investigation into the speeds of the songs at which certain rappers perform, we can see who is more versatile in their ability to deliver their lyrics, and who is more narrowly focused. Using music software, I calculated the speed of songs from different rappers’ discographies. In certain situations, I was able to use every official album from an artist; in others who had a smaller output, I was forced to limit the search to only their studio albums. However, this always resulted in a sizable data set of at least 36 songs. When I think “versatility” in rap, there’s only one person who comes to mind: Black Thought, emcee for the rap group The Roots. But not me, which is where my aforementioned promise of statistical funsies comes in. Each of those values should be read as, “60.8 beats-per-minute,” “61.8 beats-per-minute,” and so on. This is a little more helpful. We can see that at either end of the graph — all the way to the left, or all the way to the right — we start getting some outliers, which are points that aren’t very close to the main portion of the data. The above graph shows where Black Thought’s BPMs fall most often. 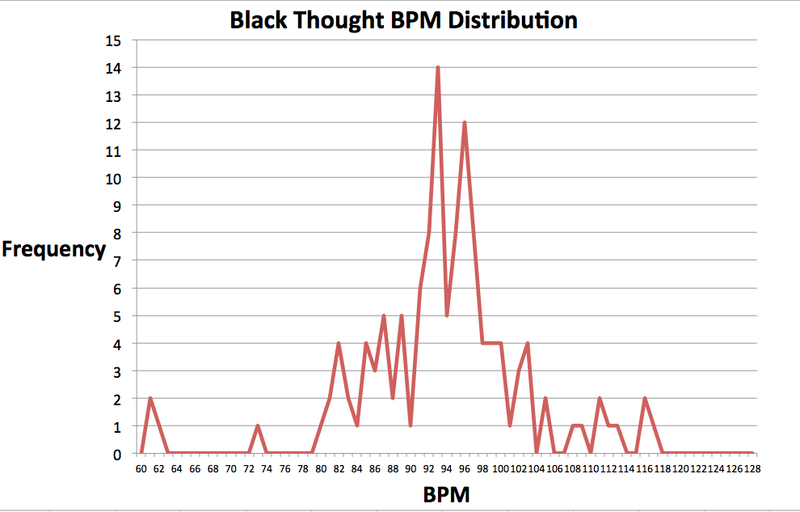 The horizontal axis along the bottom of the graph shows the BPMs, while the vertical axis along the lefthand side shows how often Black Thought had a song with that BPM along on the bottom. For instance, go to the chart’s highest point in the middle, closest to the very top of the graph. This falls along the vertical “Frequency” axis at exactly 14 times, while it falls on the horizontal “BPM” axis around 93. This means that Black Thought had 14 songs with a BPM of 93. This is his most common BPM, and applies to songs as different as “Stay Cool,” “What They Do,” and “Ain’t Sayin Nothin’ New,” which all come from 3 different albums. As we’ll see soon, Black Thought has a very wide range of BPMs. His slowest song is at 60.8 BPM, and his fastest at 117 BPM. This gives him a BPM range of about 56.2 BPM. His song’s average BPM is 93.2, which I suspect is true for most rap nowadays. That number also fits in very well with the frequency distribution of his BPMs, since it is a number very nearby — 93 BPM — which is the most frequent in Black Thought’s musical speeds. If I suspected Black Thought to be extremely versatile, then I suspected another rapper, Waka Flocka, to be more limited in his musical approaches. If I applied the same operations to his rap that I just did for Black Thought, could I back this up with empirical proof as well? Even in simple list form, some differences between Black Thought’s musical speeds of Waka’s speeds immediately stands out. For one thing, Waka Flocka’s speeds are more concentrated at the lower end of the BPM speed; 29 of the songs fall between 60 and 70 BPM. (For the musicians: double-time tempos were reduced to a straightforward BPM.) 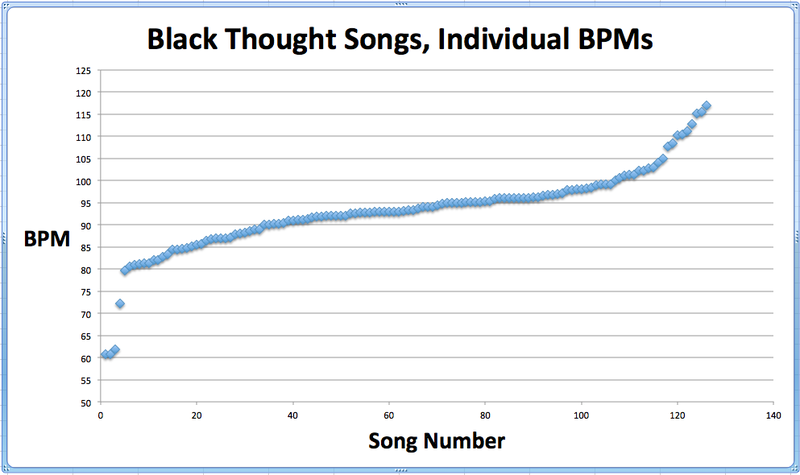 We can also see that Flocka’s slowest song, at 60 BPM, is slightly slower than Black Thought’s lower limit of 60.8. Additionally, Flocka’s fastest song, at 85 BPM, doesn’t come close to Black Thought’s comparatively breakneck speed of 117 BPM. So while Black Thought’s range of speeds is 56.2, as we said before, Waka Flocka’s range is only 25. 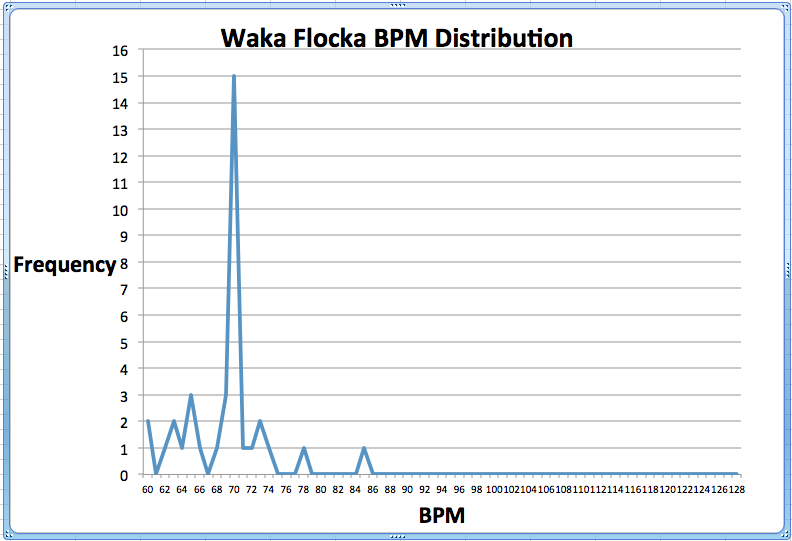 As we can see, Waka Flocka’s BPM speeds are mostly all the way on the left, towards the slower and lower end of the spectrum. Meanwhile, Black Thought’s speeds were more equally spread out. We see that Black Thought’s output has a wider spread of speeds, as well as more songs at more different speeds than Waka Flocka’s. Waka Flocka is also more consistent in his choice of musical speeds; his most chosen speed was chosen 15 times, while Black Thought’s most chosen speed was chosen 14 times. These statistics have already yielded some great results in describing the differences between rappers. Simply put, Black Thought raps over quicker songs, while Waka Flocka raps over slower songs. However, we can also calculate how much variation there is in each rapper’s output by talking about each data set’s standard deviation. If a set of numerical values has a high standard deviation, the values are very spread out; if it has a low standard deviation, the values are grouped more closely to each other. We want to use standard deviation because it is, in this instance, a measurement of a rapper’s versatility. That’s because the set for which we’re finding the standard deviation is the set we’ve been talking about this entire section so far: the speed of songs. A higher standard deviation means a wider spread of points, which means a wider spread of song tempos, which means a more versatile rapper, because they can rap over a greater variety of musical speeds. Get it? 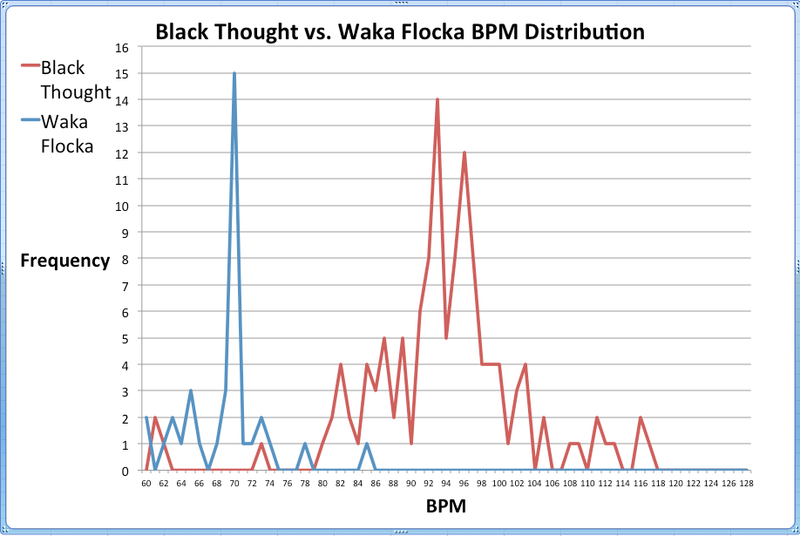 How do you think the standard deviation for Black Thought’s BPMs and the standard deviation for Waka Flocka’s BPMs compare? Who will have the higher standard deviation, and, thus, the greater amount of versatility? And Black Thought’s is…9.16, much greater than Flocka’s 4.77. This quantitatively confirms the qualitative assertion with which I began this chapter: that Black Thought is a very versatile rapper. So WF might be a great rapper, but it wouldn’t be because of his versatility. And not just because he too has the good luck to be from Philadelphia. Will Smith’s Big Willie Style was the first. Obviously. A rapper who’s been in it since at least 1992 is bound to have a huge amount of recordings, so to gather every song was basically unworkable. Double-time songs in these charts are represented in straight time, at their “true” speed, without double counting quarters. Interesting analysis, man, as always. I was wondering, though: is tempo/BPM the best way to determine versatility? A lot more work for you, but it would also be fun to look at things like keys and "type" of song (softer, harder, I'd call them dynamics, but I'm not sure that rap or modern pop have dynamics quite the same way . . . ). Just a thought.